Recycling turns materials that would otherwise become waste into valuable resources. Collecting empty ink and toner cartridges and taking them to a collection facility is just the first in a series of steps that generates a host of financial, environmental, and social returns. The recycling process includes collecting recyclable materials, sorting and processing recyclables into raw or re-usable material, manufacturing these materials into new products, and purchasing recycled products. 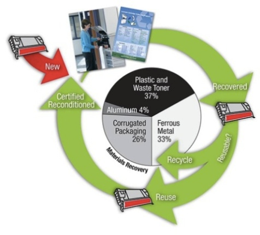 This process creates a circle or loop that ensures the overall success and value of recycling. Governments, as well as businesses and individual consumers, each play an important role in making the recycling process a success. At home and in schools, parents and teachers should educate children and instill the importance and benefits of recycling and of caring for and about our environment. In 2002, President Bush proclaimed Nov. 15 “America Recycles Day.” The federal government has recognized the importance of the recycling industry, which at the time had created approximately 1.4 million jobs, producing billions of dollars in annual revenues. 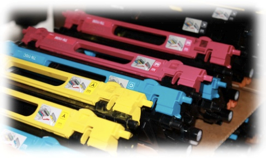 The typical used toner cartridge weighs about 3 pounds and is composed of 40% plastic, 40% metal, and a smaller percentage of rubber, paper, foam, and toner. The plastic used in a printer cartridge is made of engineering-grade polymers and takes at least 1,000 years to decompose. Additionally, the process required to make a new OEM cartridge requires the burning of fossil fuel (oil or natural gas). Approximately three quarts of oil are burned to make each new cartridge shell. It's easy to see what a difference choosing remanufactured cartridges makes to our community and to our planet. If you already recycle your empty ink and toner cartridges, you're among a growing number of people who understand the benefits of recycling. 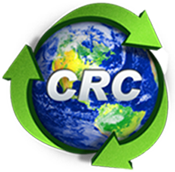 By recycling your empty cartridges with Core Recovery and buying remanufactured cartridges from Unitone Imaging Supply you are choosing to save money, minimize waste, conserve energy, prevent pollution and use a product that is economically efficient.